The Rock is a hugely popular and beloved figure. It might have to do with his uber-positive attitude, his amazing work ethic, his generosity, and his apparent passion for everything he does. I think a lot of it has to do with the fact that he's very aware of his hulking frame and contrasts it with a gentleness in his demeanor. Dwayne Johnson is really big puppy dog and he knows it. It's why he was able to create such a wildly successful persona like "The Rock": he's not an arrogant or egotistical guy, but a caricature of an arrogant and egotistical guy. Since he took the character situationally seriously, but not himself, he was able to have genuine fun with "The Rock" and ended up creating a legend that resonates with not just fans of the WWE, but people all over the world. It's that big puppy-dog-ness that I believe so many people fall in love with the most though, more so than the uber-douchebag, mostly because I think that's super honest for Dwayne. Which is probably why so many people are flipping out over his latest Instagram post where he visited his adorable aunt in Georgia. 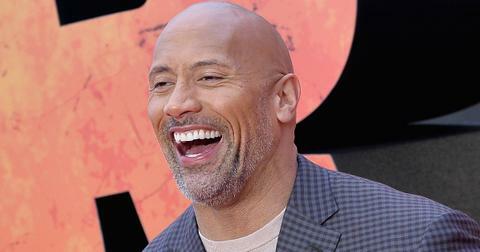 The Rock writes in his post that he "road-tripped" down to Macon, Georgia, to pay his 88-year-old Aunt Dorothy her respects. Given the man's insanely packed work schedule where time is a lot of money, the fact that he goes out of his way to visit family members instead of doing lines off of strippers' hip bones and partying with the glamorous "elite" has his fans fawning. In the full message praising his Aunt Dorothy, Dwayne reflects on the "craziness" of his life (which includes waking up at 4 a.m. every morning to workout) and how grounded and humbling it was to spend some time with a woman he grew up with and missed dearly. We road tripped down to Macon, to spend some good time with our Aunt Dorothy who’s 88yrs young. Funny cause it hit me yesterday as I was driving back to Atlanta, that my life is the craziest it’s ever been and I didn’t know much I TRULY NEEDED to go to a place where things can really slow down for me and I can just breathe and enjoy some good quality family. Hard to explain, but this was good for the soul. The Rock's not the only hulking Samoan to win the hearts of people everywhere for visiting a lovely older lady in their family. Jason Momoa recently went viral when he visited his grandmother in Iowa and took a series of incredibly cute photos with her. He then gushed about how amazing of a woman she was. I mean if your significant other wasn't already dreaming about this dude just from seeing him in commercials for Aquaman, then it probably doesn't help your chances when he goes and does some wholesome stuff like this. Whatta guy. Muscles, Samoan heritage, successful entertainment careers, and a love of family aren't the only traits The Rock and Jason Momoa share. In fact, The Rock's even expressed interest in having Jason play his brother in the Fast & Furious spin-off, Hobbs & Shaw. The Rock tried to book Momoa for the first film, but unfortunately, due to scheduling conflicts, they just couldn't make their schedules align. Dwayne isn't too fazed by it, however, as he's confident H&S will be getting a sequel and he plans on getting Khal Drogo on board for that one. Anyone interested in seeing these two guys share the screen? I think I'd might die of testosterone poisoning if I did.